(i.e. spatial reference memory task), whereas A/J mice performed better in the SA (i.e. spatial working memory task). influence of emotional reactivity on different forms of cognition. esses signaling relevant cues about environmental changes. selected on the basis of their significant survival benefit. factors for rapid adaptive decision making processes. ory tasks [9,10], especially in rodent studies [11-16]. factor that could account for their learning performances. dard forms of reference and working memory tasks (i.e. ± 1˚C) and removed every day aft er the end of the session. were available 85 cm from the pool, on the walls. ered with sawdust to make the apparatus less aversive. the beginning of the next trial. two) and multiplied by 100.
pared to A/J (t = 2.274; df = 14; p = 0.0392). ference between the two strains in session 4.
are the adjacent quadrants, and O is the opposite quadrant. = 14; p = 0.0001). spatial working memory learning task (SA). this test were significantly better than BALB/c. terms of relations between emotion and learning . stress and spatial cognition . esses), are a function of the degree of emotional arousal. be uni-dimensional, but woul d be ta sk-dependent. ory) and involv ed neural substr ates (e.g. hippocam pus). limbic system is largely implicated in emotional response. authors thank Helen Morrison for language revision. Review of Neurosciences, Vol. 23, 2000, pp. 155-184. Vol. 29, No. 3, 2005, pp. 469-491.
esses, Vol. 52, No. 2-3, 2000, pp. 89-95.
nal of Physiology, Vol. 49, No. 1, 1999, pp. 1-10. A. Fischer, M. Radulovic, C. Schrick, F. Sananbenesi, J.
ory, Vol. 87, No. 1, 2007, pp. 149-158. Research, Vol. 152, 2004, pp. 109-120.
biology of Learning and Memory, Vol. 84, No. 3, 2005, p.
Stress,” Pharmacology, Biochemistry, and Behavior, Vol. 83, No. 2, 2006, pp. 186-193. J. N. Crawley, J. K. Belknap, A. Collins, J. C. Crabbe, W.
tions for Molecular Studies,” Psychopharmacology, Vol. 132, No. 2, 1997, pp. 107-124.
havior, Vol. 60, No. 5, 1996, pp. 1247-1254. R. G. M. Morris, P. Garrud, J. N. P. Rawlins and J.
pocampal Lesions,” Nature, Vol. 297, 1982, pp. 681-683. 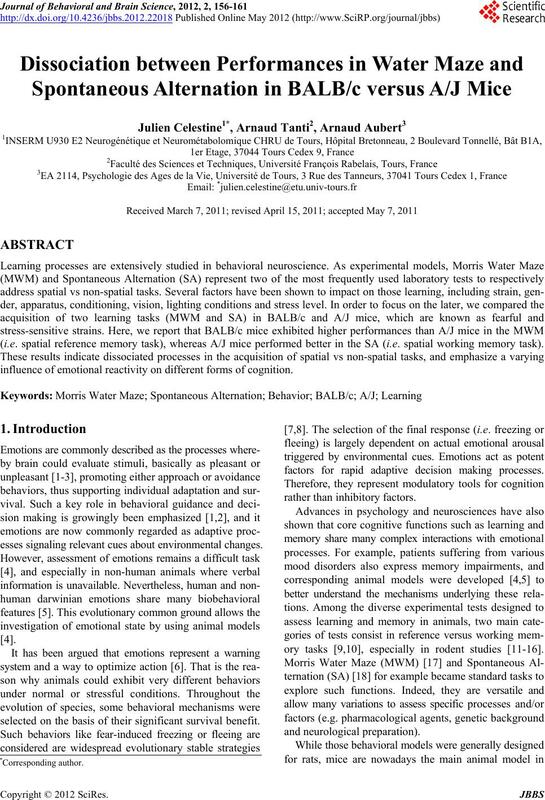 Alternation,” Neuroscience & Biobehavioral Reviews, Vol. 26, No. 1, 2002, pp. 91-104. Brain Research, Vol. 165, No. 1, 2005, pp. 36-51.
ences, Vol. 26, No. 3, 2003, pp. 132-136.
search, Vol. 150, No. 1-2, 2004, pp. 25-32. V. Kazlauckas, J. Schuh, O. P. Dall’Igna, G. S. Pereira, C.
Behavioural Brain Research, Vol. 162, No. 2, 2005, p.
Behavioural Brain Research, Vol. 152, 2004, pp. 35-48. E. H. Owen, S. F. Logue, D. L. Rasmussen and J. M.
Neuroscience, Vol. 80, No. 4, 1997, pp. 1087-1099.
havior, Vol. 72, No. 1-2, 2001, pp. 271-281. 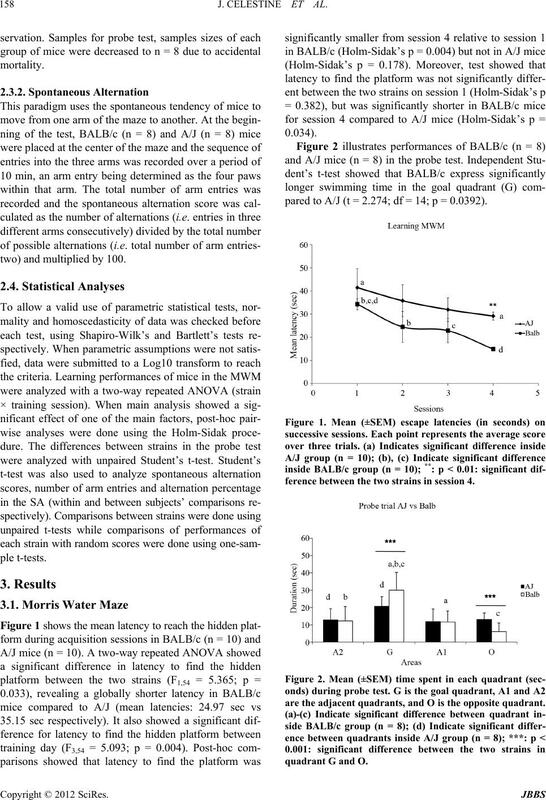 BALB/c Mice,” Physiology and Behavior, Vol. 73, No. and Memory, Vol. 85, No. 2, 2006, pp. 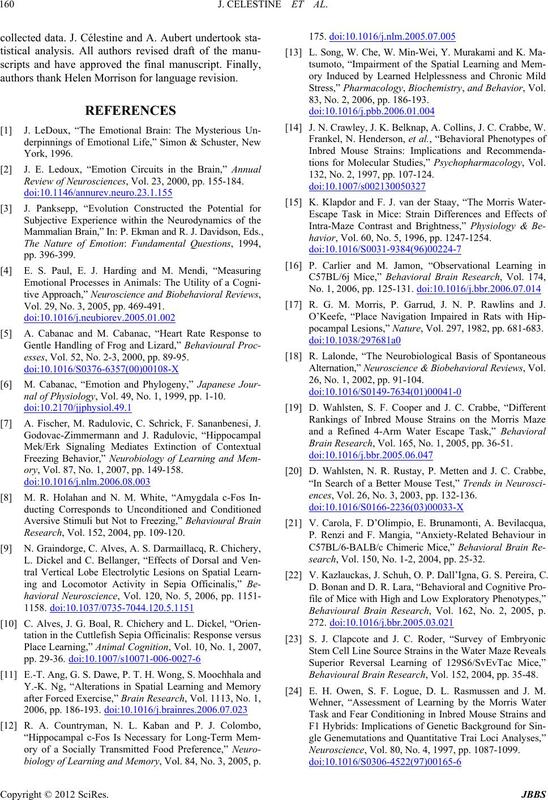 164-172.
ory,” Brain Research Reviews, Vol. 36, No. 1, 2001, pp. Research, Vol. 117, No. 1-2, 2000, pp. 115-118.
ology & Behavior, Vol. 78, No. 2, 2003, p. 303. Vol. 58, No. 1, 1995, pp. 57-65.
ropsychopharmacology, Vol. 33, No. 1, 2007, pp. 88-109. Science, Vol. 301, No. 5634, 2003, pp. 805-809. 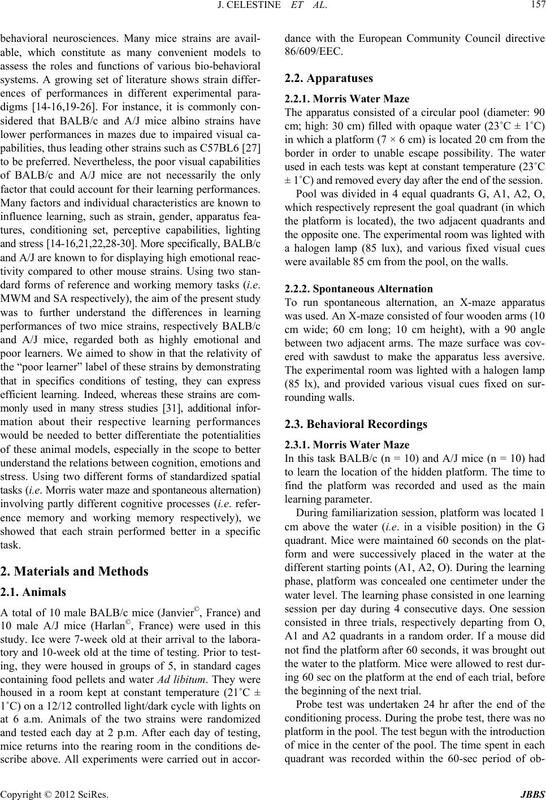 Strains of Mice,” Learning & Memory, Vol. 14, 2007, pp. Behavioural Brain Research, Vol. 176, No. 1, 2007, pp. ment,” Science, Vol. 284, No. 5420, 1999, pp. 1670-1672. Vol. 134, No. 1-2, 2002, pp. 49-57. No. 2, 2005, pp. 275-281. 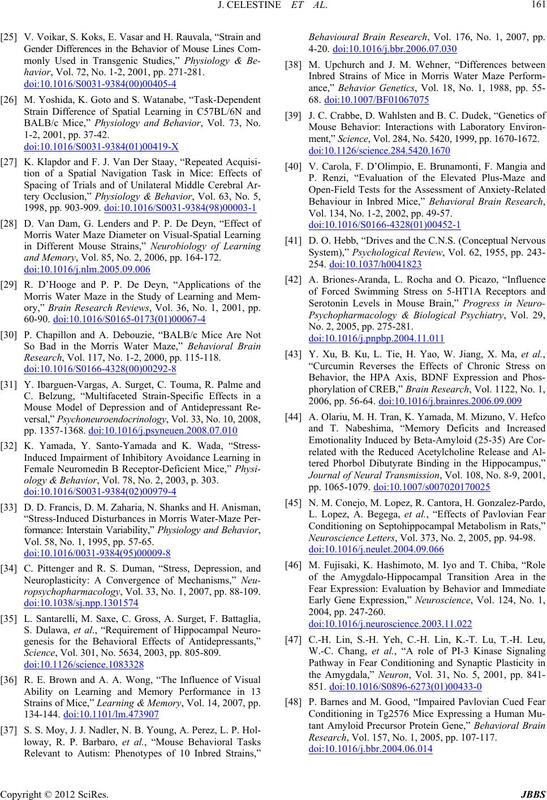 Neuroscience Letters, Vol. 373, No. 2, 2005, pp. 94-98. Research, Vol. 157, No. 1, 2005, pp. 107-117.